2 units of (2’ by 4’) Tables - Please bring along your own black table cloths. Only black table cloths are allowed to be used. Shared power point for laptops, mobile phone and table top lighting (please bring along your own multi socket extension). No addons are available at this juncture for each booth. We will advise closer to the date on this option. Set in the heart of Singapore’s downtown Civic District and surrounded by significant historic landmarks, Capitol Piazza will house the world’s most prestigious brands, preeminent flagship stores, a unique retail complex and world-class restaurants along a sheltered promenade. Capitol Piazza brings luxury to a new level through the seamless integration of street front shopping, interesting retail concepts, ultimate dining experiences and exciting entertainment. Set in the heart of the development, the retail mall and shopping promenade will be at the center of a myriad of occasions including red-carpet galas, celebratory fiestas and exclusive events, all through the year. TGIF Bazaars is glad to be appointed as the National Day Market organizer at this prestigious venue. - There's a food court in the basement. - There are many restaurants there. - There's a church inside Capitol. - There's City Hall MRT Station. And most of all, the Outdoor Plaza is very visible! No single day booking is available for this bazaar. Merchants must start selling at 12.00 noon every day except friday, at 7 pm but must strictly stop before 8 pm on 12 Aug. Preference will be given to vendors who bring in unique offering of products. Pre-packed, instagrammable food related products are allowed but subject to final approval permitted by the venue owner. On site sampling is encouraged. No pre-loved, copyright infringing or replica products are allowed. All merchants must display their products in an aesthetically pleasing manner. All products are subject to approval by the organiser and venue owner, without prejudice. The organiser reserves the right to change terms and conditions without prior notice. 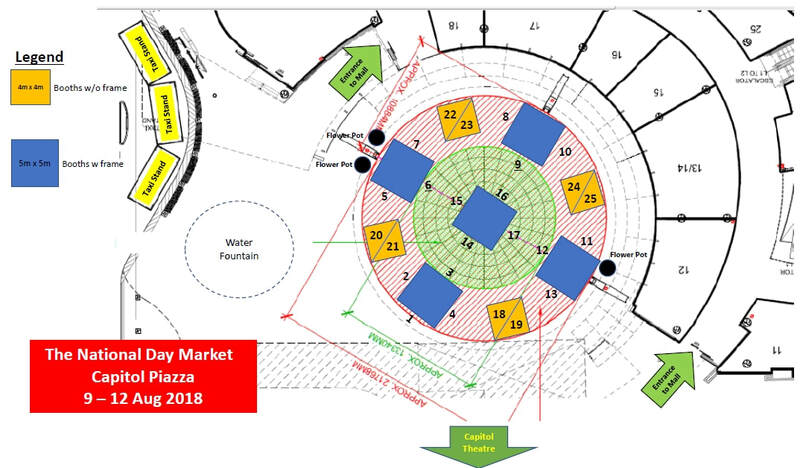 ALL booth numbers / locations are allocated and determined by the organiser. For first-time vendors, please send a snapshot of at least 2 to 3 images to sales@tgifbazaars.com if you wish to enquire. Should any vendors wish to leave their merchandise overnight, please note ONLY solid black cloth is permitted to cover up their items. Any overnight storage decision will be solely up to vendor's discretion. 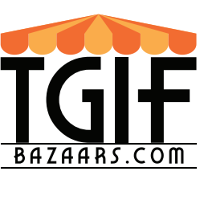 TGIF Bazaars and the venue owner shall be responsible for any losses and damaged caused to vendor's items. Layout (Click Image to Enlarge) - Note that Layout *will* be updated ! You may request for booth numbers but this is still subject to final allocation, strictly by organiser.